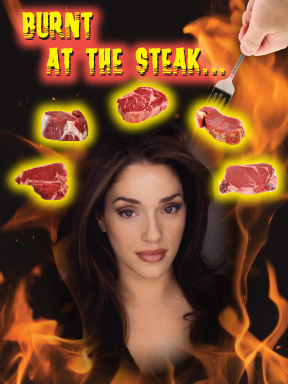 CAROLANN VALENTINO, also known as "The Italian Rose of Texas" heads to Orlando and Hollywood to serve up Grade A prime comedy and a side of sass with her critically acclaimed, knockout, one-woman hit, "Burnt at the Steak!" Whet your appetite for a night of non-stop entertainment with her eighteen hilarious characters, catchy songs, funky dancing and delightful audience interaction. This sizzling portrayal of life managing a multimillion dollar steakhouse in NYC will leave you inspired and "hungry" for more. "Her raucous show had the audience howling with laughter. Valentino's jokes are sharp and well-delivered." Dairy Center for the Arts 2590 Walnut St. When placing your reservation, please provide: the FESTIVAL name (United Solo Theatre Festival), the name of THEATRE (Theatre Row The Studio Theatre), and the specific DAY and TIME of SHOW you would like to see. ★★★★★ - "Hysterical & Engaging!" ★★★★★ - "Not-to-be missed hilarity"
★★★★ 1/2 - "Over the top impressions"
★★★★ - "Wonderfully energetic and fun"
★★★★ - "A fantastic vocalist"
★★★★ - "Hilariously clever comedy & song"
★★★★ - "Serving a performance pipping hot!" "Carolann Valentino is brilliant - she's witty, insanely Italian, beautiful, immensely talented- a dynamo!" "A dynamite performance by a most extraordinary lady who comes across as the voice and energy of a Tina Turner"
"A firecracker of a performer"
"Burnt at the Steak- right up there with Anthony Bourdain’s book Kitchen Confidential, and Lenny Henry’s TV comedy Chef T."
"An exquisite use of musical theatre!" "Carolann Valentino is a wildly talented vocalist and storyteller, with uncannily equal amounts of charisma and poise"
"The best money you will ever spend!" "Greatest musical comedy in years!" "'Burnt' is an example of how great a solo show can truly be!" "She spins, she shimmies, she's charismatic, she's amazing,-- she's a star!" Non-stop entertainment as Carolann morphs into 18 hilarious characters through song, dance, comedy, and improv!